George Lucas hasn't done a whole lot since selling Lucasfilm to Disney back in 2012. But when it was announced that Indiana Jones 5 was happening, it seemed like his old buddy Steven Spielberg would be pulling him in, since they have worked together on the other four Indiana Jones movies. It is starting to seem like that won't be the case this time around though. In a recent interview with Collider, screenwriter David Koepp revealed that, to the best of his knowledge, George Lucas won't be involved. Being that David Koepp was hired to write the script for Indiana Jones 5, he would probably know if the Star Wars creator would be helping out in some way. Here is what he had to say when Collider asked about George Lucas' potential involvement. "He's not, to my knowledge. I've had no contact with him." 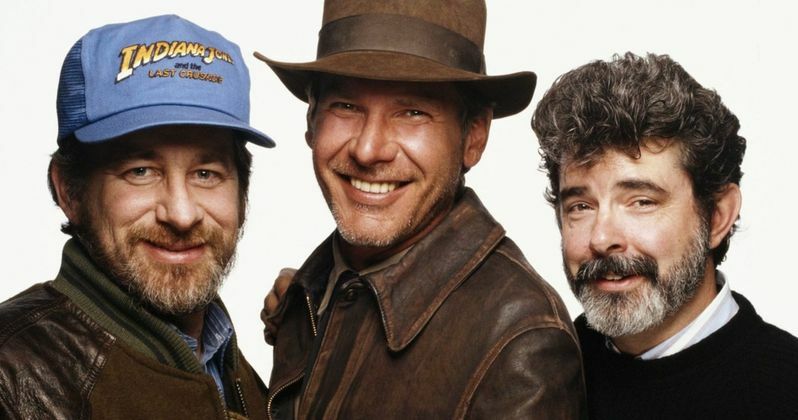 Historically speaking, the Indiana Jones movies have been a collaboration between Steven Spielberg and George Lucas. First, George Lucas would come up with a story idea for the movie, then Steven Spielberg would handle directing the movie and bringing that story to life. Lucas was always on as a producer, but it seems like Disney and Lucasfilm may have a different plan this time around. After all, they decided not to use any of his ideas for Star Wars: The Force Awakens either. David Koepp has worked with director Steven Spielberg several other times in the past with varying degrees of success. Their previous collaborations include Jurassic Park, War of the Worlds and most importantly, Indiana Jones and the Kingdom of the Crystal Skull. Given his involvement in the fourth Indiana Jones movie, which seems to be universally hated by most fans, having him on board Indiana Jones 5 may give fans some hesitation. David Koepp did also talk a bit about what he learned from Crystal Skull in the interview. Here is what he had to say. "I think that what [Indy] looks for and when he looks for it dictates what the movie's gonna be. So the selection of the MacGuffin is everything. I think Kingdom of the Crystal Skull, being set in 1957 there was a conscious desire to say, 'Much like two of the other ones were World War II movies set in the 30s and early 40s, this is '57 so a lot of our influences are gonna be science-fiction movies.' You got that with the original [script], Jeb Stuart took the first shot at it with Indiana Jones and the Saucer Men from Mars. That was a really conscious decision that dictated a lot about what the story would be and what the movie would be like, and I think that was followed through on really nicely. I thought Steve did a really good job with that. I don't know that the idea was most suited to an Indiana Jones movie, but that was what we did. So we tried to be very careful with the selection of the MacGuffin and the eras to give ourselves as much latitude to make the best kind of Indiana Jones movie that we most want to see. Learning how that's the importance of the choice of the MacGuffin is a big deal." Disney acquired the rights to the Indiana Jones franchise back in December 2013. Shortly after rumors about a fifth entry in the Indiana Jones franchise started swirling, but they mostly centered on the idea of some kind of reboot. Actors such as Bradley Cooper, Robert Pattinson and Chris Pratt were rumored to take over the franchise over the past few years, but that isn't the way Indiana Jones 5 is heading. Instead, Harrison Ford, who will be pushing the age of 80 by the time the movie gets released, is putting on the fedora one more time. The studio announced earlier in the year that Steven Spielberg would be returning to the director's chair once more for Indiana Jones 5 and that Harrison Ford would indeed be coming back. David Koepp was brought on later. We will have to see if anyone reaches out to George Lucas before the cameras start rolling, but for the moment, it doesn't seem like the phone is ringing. Indiana Jones 5 is set for release on July 19, 2019.